*The following post deals with issues of Christian faith and the person of Jesus. In fact, it’s veering into ’emotional rant’ territory, so if such things offend you or you came for sci-fi action and didn’t expect ‘religious stuff’, you’ll wanna skip this one. 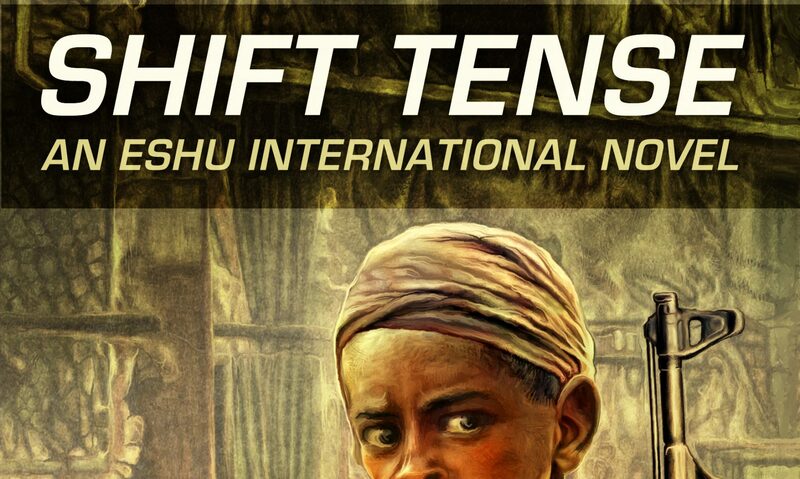 On the Eshu front, SHIFT TENSE: RED FLAGS is currently at the editors and Michal Oracz is working up the cover. I’m excited and will post relevant updates as I get solid info. Spent the better part of this morning watching I am Second videos and ended up bawling like a little kid. (try here and here to see what I mean) I need to say it doesn’t get any better than this; redemption is what Jesus is all about. It doesn’t get more simple or more profound. It’s eternal. Furthermore I believe deep in my bones if a ministry isn’t centered around salvation not just as a theory or catch-phrase but the practical day-to-day application of a real God reaching into real lives, then it’s worthless. Regardless of organizational tonnage or theological buttress, it’s only so much chaff come Judgment Day. This is the Jesus that saved me. This is the one I want to be around, the one I want to introduce people to. No bait and switch. Not someone else. I confess I’m in a crisis of faith at the moment regarding church. I am marvelously blessed in so many areas of my life: my marriage, children, grandchildren, work, writing… But this church thing is a real brawl. A while back, I had an online discussion about ministry, involvement and membership with fellow Christian and writer Jessica Thomas and said I was ‘sick and tired of being sick and tired and pretending I’m not.’ That’s where I find myself once again and it’s the literal crux of the matter. It occurred to me if I had a quarter for every sermon I’ve heard in the last 27 years lambasting immature, shallow, goosebump-seeking church-hoppers, I’d take my wife to dinner at this great little Thai joint we love. Now I know ‘free-range’ believers exist. I realize our society is infected with a selfish, consumer mentality. I also acknowledge my own incompleteness and vital need to function in community and under authority. I have no desire to end up a self-centered consumer. I am however called to be a Christ-centered steward and I want to know where the Scripture requires believers to enable mediocrity? Where does it say we have to knowingly submit to flaccid, dysfunctional theology? When did the Berean call become ‘rebellion’? Don’t mishear me: I’m not saying all ministry is vapid or shoddy. There is a lot of valid, powerful, gracious ministry, most of it unrecognized. Catastrophes always get better press. I’ve been (spiritually) living off Mars Hill, Times Square, and The Village. Let’s thank God for the internet, shall we? But for all those services scorching ‘fickle, whiny consumers’, I can’t recall any apology for all those petty (left or right) political rants masqueraded as sermons, for superficial morality passed off as righteousness, for denominational rules touted as sanctification. I know the Gospel is a hard-edged hope. Grace is balanced by Truth. But if Grace is offered with one hand while the other snatches it back with a thousand little rules and dogmatic stipulations, all you have left is a brittle parody. A painted, plaster lawn-ornament. Or how about an admission that your seeker-sensitive, tech-savvy, hip and hype approach isn’t cute, or cool, or fruitful? It’s vital to be informed and attuned to our society, but do I really have to point out that spiking your hair like an anime character and squeezing into your wife’s jeans doesn’t equate to relevance? Neither will a soul-patch or getting inked. I don’t care one way or another about a tie, but tuck in your shirt, eh? * You can stop with the pop-psychology, stop the ego-stroking, stop apologizing for every hard saying in the Bible. The Word of God is called the ‘Sword of the Spirit’ for a reason. Swords have a point and an edge, and so should you. Only the Eternal is truly relevant. Only the Truth sets people free. Trending the latest celebrity-craze (Christian or Secular) boils down to tail-chasing. It’s time to re-read “Not a Fan“. Hipster-dom isn’t discipleship: it’s sowing empty seed on shallow ground. Am I wrong or does the pulpit set the tone and temperature for the congregation? Doesn’t leadership bear a measure of responsibility? Being ‘leaders’ and all. To quote Dr. Horrible: “The fish rots from the head…” Perhaps one reason people are leaving church, having difficulty committing is it’s hard to find someone saying anything worth listening to. Don’t give me the “There’s no such thing as a perfect church, and if you find it, don’t go there ’cause you’ll ruin it” line. Most folks aren’t looking for perfection. They know it doesn’t exist. What they’re searching for – what they deserve – is something worth sticking around for. Was Jesus lying when He said the fields were ‘white unto harvest‘? God identified Himself as “I AM”. He knows every hair on my head. He knows who I am, where I am, and why I am. I get that. My days are in His hands and He’ll see me through, despite my problems. If like Elijah I have to live off what birds bring and a little stream provides for a season, then I’ll cope. (No, I’m not saying I’m a prophet. I’m talking about provision) Christians are called to declare the unadulterated Gospel and model the action of definite grace. People are dying for it. Their eternal souls depend on it. My fear is I am stuck in that prophecy, and while I’ve been seeking God in prayer and Scripture even more lately, and have confidence God will provide direction, I tremble not only for my own soul, but for my children and grandchildren. Christians are called to represent the one who saved them, to reflect in some fashion the character of their Lord and Savior. I think the best we flawed sinners can do – even redeemed – is provide a sketch, a caricature if you will, of God. It won’t be perfect, but God keep me from rendering some hideous misrepresentation or superimposing some mortal icon. When I stand before Him, I’d like to have got the important features and proportions correct so it was recognizable. *My personal conviction is if you’re making dress code of either extreme a major plank in your ministry, you’ve already missed the point. I have almost too m I’m almost too many thoughts for concise comment here let me just say that I’m really on the same page with you in a lot of ways and it’s one of the main issues with my faith right now am there’s a lot of criticism for “church-hoppers”but at the same time there’s not really a lot of acknowledgment that Sunday congregations are in for a practical purposes broken beyond repair. I’ve become increasingly aware of the fact that so many churches have an overload of paid employees and so much of the church time is focused on this balancing act between serving God and Mammon that we are getting the Gospel set aside in favor of entertainment shallowness the kinds of things that keep people coming and get back and I keep hearing he’s hearing these comments saying these videos that talk about how we need to stay in church “” but they’re always From people who were employed by the church so it seems to me like so much of that you must go to what we consider traditional church is just a self-fulfilling self-perpetuating keep coming to keep the funds coming in there isn’t necessarily a lot of concern about spiritual growth and meeting the spiritual needs of the members of the body. I understand the primary purpose of church is not to entertain the believer but is to focus worship on Christ nevertheless I still think there are many valid criticisms about how the structure of church does nothing at all for the growth of the members of the body I think there needs to be a revolution in the way a lot of us to church and I think that revolutionists happening by default as so many people gravitate away from the traditional –or what is traditional to us –setup. Good to hear from you. Hope all is otherwise well. I may have a career “writing” Cormac McCarthy style prose. May God bless you, Pat. I hope you find your way. Patrick said: Am I wrong or does the pulpit set the tone and temperature for the congregation? I know and I’m slugging it out. It’s not like I’m going to quit on Jesus. I’m trusting for a way to navigate out of this internal and external morass. I suspect its a combination of attitude adjustment and finding some solid local ministry.